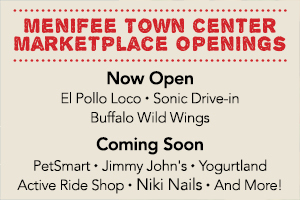 Menifee Town Center Marketplace Happenings! SONIC, America’s Drive-In, recently celebrated their grand opening! Enjoy personal carhop service and choose from a delicious menu filled with unique drink combinations, burgers, popcorn chicken, real ice cream sundaes and more. Exciting things coming to Menifee Town Center in the future include an entertainment center with a movie theater and 14 stadium-style auditoriums, 16-lane bowling alley, sports bar and fun zone. Great things are on the way! 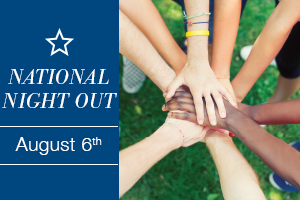 National Night Out is an annual community-building campaign celebrated across the country. Join us on August 6th from 4 p.m. to 8 p.m. at Wheatfield Park to meet local law enforcement, help organize a neighborhood watch, socialize with neighbors and enjoy refreshments. National Night Out promotes police-community partnerships and camaraderie among residents in an effort to make our neighborhoods safer and better places to live. This is an important initiative for Brookfield Residential whose team is deeply committed to creating partnerships that enrich the lives of its homeowners. We look forward to sharing this special night with you!